When you have sustained an injury, it can be a daunting time. You may be wondering what you have done and how you can best manage it to get back on your feet as quickly as possible and return to normal function. This is where Physiotherapy can help you. We are qualified and highly experienced at the assessment of any musculoskeletal condition, the management for and the expertise to get you back to the highest level of function in a timely fashion. During any acute injury, at the level of your tissues, there will be a level of disruption. Some of the tissues in the area, whether ligaments, tendons or muscles may have sustained a degree of tearing or compression. As a result, we experience pain and swelling local to the area of concern. It is important to follow these steps as soon as you have sustained your injury. The sooner you act, the higher the chance of enabling your body to move on to the next stage of healing. If you have great concerns about your injury, it is integral that you liaise with your Physiotherapist or Doctor as soon as possible. If you require the fitting of crutches or a sling, general guidance and/or reassurance, it is crucial to make that phone call straight away. If you have a deep skin tear, a gross deformity at the area of the injury, excessive and uncontrolled pain, it is critical to seek the medical attention at the Emergency Department of your nearest hospital. You will be able to receive adequate pain relief, attention to any wounds and imaging, if required. Once you have survived of the first 24 to 48 hours, it is important to meeting with your Physiotherapist. They will be able to assess you, determine the type and severity of the injury and devise an appropriate rehabilitation plan. From this point, your Physiotherapist will seek to minimise the pain, swelling and inflammation of the area and commence work to restore normal movement. These factors will involve a combination of many treatment modalities including hands on treatment, taking you through certain movements and exercises, taping techniques or bandaging, fitting of a brace or walking aides, etc. You will also receive a program that you will be advised how often to partake in, to actively assist in the recovery process. Any soft tissue injury can take a minimum (with minimal tissue disruption) of three weeks to recover and upwards of six weeks. This will typically be the case if you have a very complex injury, or it involves structures that have a poor blood supply or under a great load in the body (such as the intra-vertebral discs or a nerve) 3. It is important to be aware of things that you can do to reduce the risk of delays or setbacks. During each of your consultations, your Physiotherapist will continue to progress your program, to put gradually increasing stress on the scar tissue that is healing, to help lengthen it and strengthen it. When your body is ready, you will be given progressive exercises to help strengthen the area and the surrounding structures, to ensure your body is not compensating for the original injury. These compensatory strategies are an easy habit in which to fall, and can be very difficult to break. Your body may have other mechanisms that require attention during your rehabilitation, such as your balance, or components of your balance. You should be regularly taken through mini-assessments of each component that has been affected by the injury, to ensure there is reasonable progress and an adjustment of your exercises and home program to match accordingly. During the recovery progress, your Physiotherapist will continually liaise with you, as to your goals for returning to particular levels of function, aspirations with your sporting, social and working environments. They will also make recommendations for the steps you can take to reduce the chance of injuring yourself again. If you would like more information, or have a question about your recovery, be sure to speak with your treating Physiotherapist today. The following is a guide to understanding Tennis Elbow, its symptoms, who is vulnerable, how it is diagnosed and the recommended treatment. “Tennis Elbow” is a broad term often used to describe pain or discomfort on the outside of the elbow. This pain has occurred from overuse of the hand, wrist and forearm musculature. The term “Tennis Elbow” was given after a high proportion of tennis players developed the condition through repeated stress of the common extensor tendon of the elbow. Despite the origin of its name, Tennis Elbow is not limited to the tennis population 1. Tennis elbow occurs either acutely or gradually over time. The bony part on the outside of the elbow (lateral epicondyle) is where the muscles and tendons converge to form a common tendon. This tendon attaches to the bony prominence and they permit movement of the hand and wrist (Fig 1). Health professionals will define tennis elbow as an extensor tendinopathy; this refers to pain and possibly inflammation around the lateral epicondyle. Another common term used to describe pain around the elbow, is ‘golfer’s elbow’. 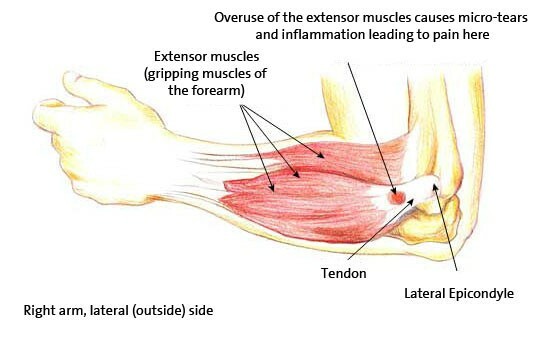 This is referring to pain on the inside of the elbow (medial epicondyle) and is also known as flexor tendinopathy. Tennis elbow is prevalent on the side used for repeated gripping, high levels of resistance and movement at the wrist. This is why the condition most commonly affects people on their dominant side, though, can occur in both arms 2. Tennis elbow has been found to affect between 1% and 3% of the population and the incidence for repetitive tasks is 30% and among tennis players has been extremely high, with up to 40% of tennis players being affected during their careers 1 . Tennis elbow more commonly occurs in men than women and is frequently present between the ages of 30 and 50 years. However, Tennis Elbow can affect people of any age 3. Despite being highly prevalent among tennis players, Tennis Elbow may affect anyone who participates in work or leisure activities involving repetitive use of the elbow, hand and wrist. The likelihood of tennis elbow occurring from these other activities is increased by the force during gripping as part of the action. Tennis elbow can be diagnosed by your Physiotherapist. During the consultation, your Physiotherapist should ask you a number of questions about your symptoms before they take you through a series of tests to determine the source of pain. Only a small proportion of people require other imaging such as an ultrasound or CT. This will typically be because the symptoms may not fit the expected diagnosis. Other structures may be involved, or a person may not be responding to the usual management of the condition. Tennis elbow is successfully managed with Physiotherapy treatment and a rehabilitation program. Other possible treatment includes cortisone injections, and in severe cases, surgery if there is no improvement with conservative means. The management of tennis elbow is tailored to an individual and will be influenced by your medical history, pain levels, hand and wrist function and other medications you are currently taking. When the pain and discomfort have begun to subside, your Physiotherapist will take you through some specific exercises to stretch and strengthen the muscles and tendons surrounding the elbow. There will be specific movements that you will be advised to avoid. This will include any activity that causes pain to the elbow either during or afterwards. Your recovery may also be assisted with taping of the elbow / forearm or the use of a specific brace fitted by your Physiotherapist. What is the recovery rate for people with Tennis Elbow? Generally, 95% of people will make a full recovery with Physiotherapy treatment and management. Around 5-10% of people require surgical intervention to repair the muscle and tendon around the elbow. In the 5% who undergo surgery, 80-90% experience pain relief and restoration of function 1. Brukner, P., & Khan, K. (2009). Clinical Sport Medicine (revised 3rd Ed.). McGraw-Hill, North Ryde. Does the temperature have any bearing on whether/how to prepare for workouts or runs? In the winter months, I recommend spending that little longer warming up and easing into your run. Injury risk increases when you go straight into a workout without preparation. Even though it is cold, don’t be fooled into thinking you don’t need to drink as much water as you would need to on a summer’s day. Make sure you monitor your water intake the same way you would in those warmer seasons. Appropriate clothing is a must. We are lucky that our climate in winter is fairly mild. However, a lot of heat can escape from our hands, feet and head. So you might need to have a look at your running wardrobe and update a few items. Are there other seasonal hazards related to typical workout types in winter? Your winter workout surface can most certainly be a potential contributor to injury. Unstable, slippery or hard surfaces can increase the risk of developing injuries such as, plantar fasciitis, shin splints and Achilles tendinopathies. Another surface that tends to get forgotten is the good ol’ treadmill. This is a popular choice for gym goers who still would like to do their running training when the weather isn’t cooperating. When you think about it, the treadmill belt helps you run. It makes the running gait a little easier by assisting your hip extension (pulling your leg back). In turn, your glutes don’t get their regular workout they would on your favourite running track. It is important to keep in the back of your mind if you have had to do a little more treadmill running training that usual, spend more time focusing on some isolated glute strengthening exercises like lunges, clams and sidelying hip abduction exercises. This will help prevent the stain on the knee when it is a sunny day and you hit the running track again after prolonged treadmill training. Or maybe it’s a good time to spend time indoors fixing technique that may over time lead to injury. I highly recommend including an indoor strengthening and stability regime to your running schedule that involves focusing on your gluteals, quadriceps, hamstrings and your core. In practice, I see that there can be a common reason why athletes get injured. They neglect the rule of the Terrible Toos. This can be especially relevant in the winter months as your body is working extra hard anyway to deal with the weather and any changes in the terrain. Delayed onset muscle soreness (DOMS) is a normal part of increasing our exercise regime and I think it is a nice friendly reminder that we are doing good for our body. However if you have pain or discomfort that doesn’t fall under the category of “good sore” then it is time to get help. If gentle stretching, adequate warm up/cool down, use of a foam roller (Figure 1) and rest don’t help it is vital to see a physiotherapist that has experience working with athletes and getting them back in their runners. Jennifer Dodge received her Bachelor of Physiotherapy from The University of Newcastle. Her combined interest in sports medicine and occupational health has enhanced her practice in the clinical setting, with elite athletes and contributed to the success of her business The Office Athlete. Jennifer is registered with AHPRA and HAAD, practicing in both Australia and The United Arab Emirates. Hip impingement, also known as femoroacetabular impingement (FAI), is a condition where there is abnormal contact between the femur bone (femoral head) and the socket of the hip joint (acetabulum) during certain movements of the hip. The resulting impact can lead to damage of the cartilage inside the hip joint. This may in turn lead to premature arthritis. FAI is traditionally described as due to either an abnormality of the shape of the ball of the femur (CAM deformity) or of the acetabular socket (PINCER deformity). Movement of the hip joint is complex, and more recent research has demonstrated that the overall 3-dimensional shape and orientation of the hip should be considered to properly evaluate and treat clinical impingement. Patients with FAI often experience pain in the groin with deep flexion (bending) or rotation of the hip during certain activities. There may also be inflammation of the tissues surrounding the hip such as on the outer side of the hip (trochanteric bursitis), the groin muscles (adductor tendonitis) or inflammation of tendons in front of the hip, especially if the condition has been around for some time. Eventually, as the damage continues, the patient may begin to develop more arthritic symptoms such as a stiffness and a dull ache in the groin. Hip-related pain is not always felt directly over the groin. It may also be felt on the outer aspect of the thigh, the buttock or traveling down the leg. Patients who have symptoms suggestive of hip impingement are usually investigated with x-rays of the hip first. Further investigations could include a CT scan and special MRI scan. The CT scan is performed to study the bony detail of the hip and the MRI is used to assess the cartilage, labrum and other soft tissue structures in and around the hip. Treatment of femoroacetabular impingement symptoms often begins with conservative, non-surgical methods. Physiotherapy treatment may involve soft tissue work to relieve tight muscles around the hip, however the majority of treatment is rehabilitative based, to try strengthen the deep hip stabilizing muscles. The aim is to improve the stability and function of the hip. At Port Melbourne Physiotherapy & Pilates we commonly treat patients with hip/groin pain with a structured Pilates program aimed at strengthening the hip and pelvic muscles. Rest, activity modifications and selective use of non-steroidal anti-inflammatory medication are often helpful in alleviating early symptoms. An injection of the hip joint with anaesthetic can provide some relief as well as diagnostic information in patients with symptoms which are unresponsive to treatment. For patients not responding to conservative management, Femoroacetabular Impingement (FAI) can be addressed with surgery to improve the shape of the hip. The aim is to correct the bony deformity before there is irreversible joint damage. In many cases this can be done by hip arthroscopy (keyhole surgery). If you’d like further information on FAI or if you feel your symptoms match the description above, speak to your physio about what treatment options are available for you and whether further investigations are required. https://freshstartphysio.com.au/wp-content/uploads/2017/08/What-is-Femoroacetabular-Impingement-FAI.jpg 1442 958 Guest Post https://freshstartphysio.com.au/wp-content/uploads/2016/05/logo-colored-300x120.png Guest Post2017-08-08 19:32:182018-07-26 14:13:31What is Femoroacetabular Impingement (FAI)? In this post we will focus on knee injuries, and what treatment may be required to get back to living your barefoot lifestyle! Common knee injuries can occur through daily movements and activities, whether it be a car ride, sport or landing differently on your knee. Three common knee injuries we will look at are ACL, PCL and Meniscus tear which cause discomfort and potential long term effects if not treated properly. Medial collateral or lateral collateral ligament tear: Damage to these ligaments typically occur from changing direction. This can be when the foot stays planted or a direct blow to the inside (LCL) or outside (MCL) of the knee. Symptoms include localised pain, swelling and feeling of instability. ACL tear: Depending on the severity of the injury, the ACL could be strained, partially torn or completely ruptured. Damage to the ACL is often caused by pivoting/change of direction when the foot remains planted (most common). Damage can also be caused by hyperextension (eg knee being pushed past straight) which can occur when the foot remains planted, and the body pushed sideways (eg in a contact sport). Symptoms include an audible popping noise at time of injury, significant pain and swelling immediately or a feeling of instability. Due to the mechanisms of injury, it is not uncommon for an ACL tear to occur with meniscus damage and medical collateral ligament damage (known as the “unhappy triad”). PCL tear: PCL tears are much less common than ACL ruptures, as they are stronger and larger ligaments. A PCL tear can occur from direct force to the shin, while the knee is flexed (such as knee hitting the dashboard in a car accident). 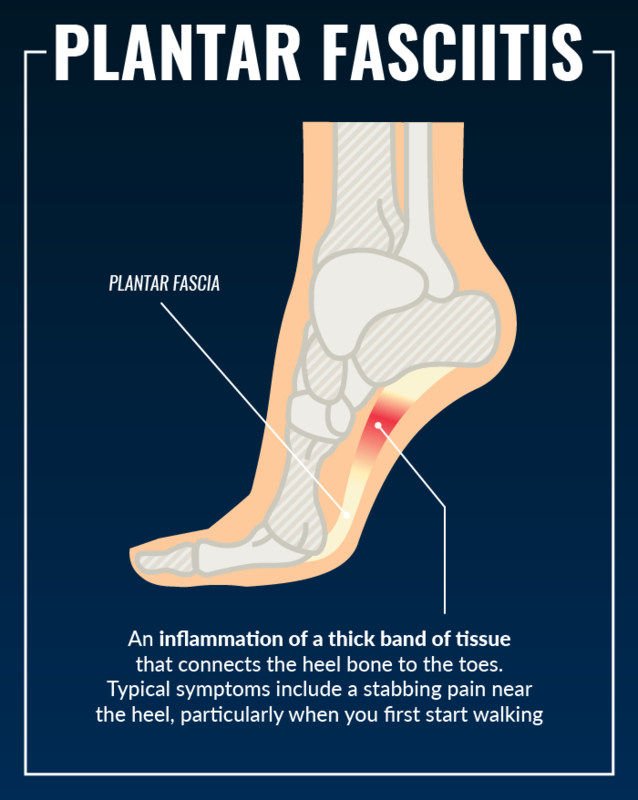 This is the most common cause of PCL injury. Another common PCL tear can occur from falling onto a bent a knee, with hyper extension causing damage to the PCL. Symptoms are often similar but far less severe than an ACL tear. Whether your injury requires surgery or not, we suggest popping in to see one of our physio’s to get you back to doing what you love, sooner! This article was originally posted on barefootphysiotherapy.com.au. It has been re-published with the permission of the author. Over one million people play golf in Australia, making it one of the highest participation sports nationally. Golf related injuries are common for both amateur and professional golfers, with lower back pain contributing to approximately 25% of all golfing injuries, in those that play at least three times per week. Research also reveals that on average a lower back pain episode will keep you off the golf course for up to six weeks. It therefore makes sense to practice not only your playing techniques but also your preparation habits – to reduce your risk of injury. We know that the main force going through your lower back during the golf swing is compression and this has been measured at up to eight times your body weight. The majority of this force occurs at impact (when you hit the ball). Low back pain is often caused by stresses to the discs, ligaments and muscles in these areas. Excessive flexion or ‘slouching’ of your spine in various positions such as when bending forward or sitting is a common cause of pain. Golfers are often giving their back a work out prior to hitting the first shot off the tee – where habits can cause stress to the back overtime. So how does this help you to manage back pain with golf? Gaining a better understanding of the contributing factors to back pain with golf is the first step. Now whether you’re looking to manage golf related back pain or prevent it, we’ve listed our most important tips – no matter your playing level. Warm up! This should incorporate specific stretching exercises; driving range and putting practice; and practice swings on the first tee. These warm up exercises should take no longer than 10 minutes each. See your physiotherapist for a massage, stretching routines, or to strengthen the trunk, low back and neck muscles using Pilates based techniques and methods. Have a 3D golf swing analysis and/or golf assessment to correct your swing technique. This is otherwise referred to as ‘the MRI of your golf swing.’ A 3D analysis can assess in detail exactly the way your body moves during the golf swing in real time. This will make the cause of your back pain during golf easy to identify and manage. See a golf professional for a lesson to ensure your technique is correct. Pay attention to correct equipment and usage – lighten your bag and push rather than pull your buggy. So next time you’re preparing to head out for a game of golf or even a practice session, take note of the above, prepare like a professional and continue to enjoy your time on the green. Ben Corso – Director of The Physio Clinic recently presented a workshop on Golf Injury Management and Rehabilitation to the Italian Sports Physiotherapy Group in Milan, in May 2017 through Manualmente. https://freshstartphysio.com.au/wp-content/uploads/2017/06/Golf.jpg 700 1050 Guest Post https://freshstartphysio.com.au/wp-content/uploads/2016/05/logo-colored-300x120.png Guest Post2017-06-25 19:24:302018-07-26 14:15:25Sore back playing golf? The winter sports season is upon us, meaning physiotherapists all around Melbourne will be dealing with athletes having suffered hamstring strains. AFL and soccer are sports with notoriously high numbers of hamstring strains the majority of which occur during high speed running. 70% of hamstring injuries in elite football players occur during high-speed running (sprinting) and the rest with stretching, sliding, twisting, turning, passing, jumping and overuse. Suffering a stretching type injury such as reaching for a ball with an outstretched leg or bending to pick up a ball whilst on the move are injuries that have on average 84% longer return to play times than contraction injuries (contraction injuries referring to hamstring strains occurring during regular sprinting motions). The area where the peak point of pain is to touch on the back of the thigh. The closer to your sit bones (the ischial tuberosity) the peak pain point is felt the longer the recover times. Location of swelling. Similar to the location of peak pain, the closer any swelling present is to the ischial tuberosity the poorer the prognosis. Most weekend warriors will not require an MRI for an acute hamstring strain but another predictor of poor prognosis found was the length of swelling upon MRI. The longer the area of swelling visualized on imaging likely indicates a longer return to play time frame. These findings although relating to the professional footballer (soccer player) can arguably be applied to the weekend warrior. Notably the professional athlete may have both more resources and motivation to aid their return to play but these can be considered useful guidelines for the armature sportsman to help with estimating a safe return to play. 45% of athletes return to play in 23 days following sustaining a hamstring strain. Individuals variations will always exist and many variables come in to play such as pre injury status, adherence to any physiotherapy guided protocols… But it is nice to have a bench mark to aim for and the realization that with the majority of hamstring strains the sportsperson is likely to miss 2-3 matches based on having weekly games. It is easy to see improving recovery times by just a few days could be the difference between missing only two matches verses three or more. In a short season every game missed through injury is significant so adherence to physiotherapy advice and protocols can help you play more matches during the season which is what being a weekend warrior is all about, getting out there and having a run. With hamstring strains rehabilitation programs based on exercises primarily involving high loads at long muscle-tendon lengths were found by Askling CM, et al to be the most effective at reducing the time to return to play. The idea is that rehabilitation in a controlled graduated fashion should attempt to mirror the particular situation that lead to the injury. Where rehabilitation of acute hamstring injuries should build on attaining eccentric loading at long muscle lengths (the phase of contraction that occurs as the muscle lengthens is considered an eccentric contraction). Eccentric loading and loading muscles towards their end of range can put strain on healthy tissue let alone muscle tissue recovering from injury so guidance with such rehabilitation techniques is crucial for successful outcomes. If you have sustained a hamstring strain having a physiotherapist assess your injury to help gauge a working return to play time frame and set up a rehabilitation protocol. Can help you return to play quicker and reduce the likelihood of any recurrence. Reference: 2013 Acute hamstring injuries in Swedish elite football: a prospective randomised controlled clinical trial comparing two rehabilitation protocols. Askling CM, et al Br J Sports Med 2013. Written by Hayden Latimer. Hayden’s practice is based in Sydney, he is the owner of Sydney Physio Clinic. Prior to opening https://www.sydneyphysioclinic.com.au/ Hayden has worked as a physiotherapist around the world for over 15 years. The new year has turned over and everyone is having a fresh start. It’s the time of year most team sports are into pre-season training, new year resolution fitness regimes are taking off and excitement is high for new opportunity. Players may be returning from long injury lay-offs, runners hitting the track following their Christmas holidays and of course cricket and tennis are in full swing. This is also means it’s the time of year that a lot injuries occur! Whether it’s an athlete returning to their sport or someone in the middle of a long season, I regularly get asked as a physio, ‘how do I best avoid injury’? The answer to this involves a lot of factors but a great place to start is to identify your injury risks and preparing well for your sport. Although accidents happen and we can never guarantee an injury won’t occur, what we do know is that different sports are more susceptible to different injuries due to their differing physical demands. For example, we tend to see overload injuries such as Achilles and Patella tendinopathies in runners and teenagers, shoulder impingements in swimmers, ankle sprains in jumping sports like basketball and netball, hamstring and groin strains in AFL footballers and of course the dreaded ACL injury with our Basketballers, Netballers and Footballers. The good news is we know that the risk of a lot of these injuries occurring can be reduced by implementing preventative strengthening and improved neuromuscular control programs. As mentioned above, a lot of sports are prone to the devastating ACL injury and given it’s long rehab and unfortunately low rate of return to previous level of sport amongst athletes who have undergone an ACL reconstruction, it’s become the ‘poster injury’ in sports medicine. As research shows that 50%-70% of non-contact ACL injuries are preventable, this makes it a great example of how identifying your injury risks and implementing an injury prevention program can help you stay on the park longer. If you’ve been listening to the news over the past few months or are just a keen sports fan you’d be well aware of the media attention and hype around the upcoming AFL Women’s, and also recently the Women’s Big Bash cricket taking off. You may have also heard or read about the conversation regarding the concern of a potential increased injury rate as these sports grow, and in particular, again, ACL injuries! The reason for this concern is due to several reasons, as research has shown us who is most at risk and why. We know through research that most at risk are girls aged between 14-18 and men aged 19-25, teenagers with recent growth spurts, previous ACL injury, athletes who are increasing their training load and the athlete who has increased their level of competition. You can quickly see why these young girls, who are going from semi-professional footballers to elite AFL stars, are regarded as high risk for injuries! Now although this attention has centred around our soon to be AFL idols, the caution for increased injury rates filters right down to our grassroots where participation numbers are on a rapid rise, particularly with our adolescent female footballers. Continuing with our example of ACL risks, our research shows young females are at more risk of ACL injury compared to young males and this is thought to be due to a smaller attachment site of the ACL, increased hip angle which biomechanically increases loading through the knees and a decreased ratio of quads to hamstring strength. What this often results in is a decrease in control through the knee when jumping, landing, twisting and turning. The mechanism for ACL injury! Now the point I’m making here isn’t that it’s all doom and gloom for adolescent female athletes, it’s how important efficient biomechanics and strong neuromuscular control are to avoid injury. Not just for ACL injury, but all injuries. Whether you’re an elite athlete, weekend warrior or returning to the running track, we’re all susceptible to injuries but they can be prevented! By identifying what injuries you’re likely to be exposed to and understanding your biomechanics, implementing an injury preventative program to improve biomechanics and neuromuscular control, you can reduce your chance of becoming another injury stat and improve performance. Remember, Prevention is always better than a cure!